When we talk about video games, replayability is an oft touched on topic. We like large games that invite players to experience the stories within it again and again. That's why games like Skyrim, Mass Effect and Grand Theft Auto V have such staying power even years after their initial release. As a tabletop player though, it is very unlikely that you'll be tempted to play through the same module or adventure path more than once. Maybe I'm wrong, and this really isn't a thing, but I have never encountered a player or group, who upon finishing off the BBEG and closing the book on their quest turned around and said, "great job everyone! Let's do it again, but this time we'll all play different characters and be total dicks to everyone." As a DM, I have run the same module more than once, but it has always been for different groups of players. The closest thing we DM's come to replayability is our player's engagement with the worlds we imagine for them. 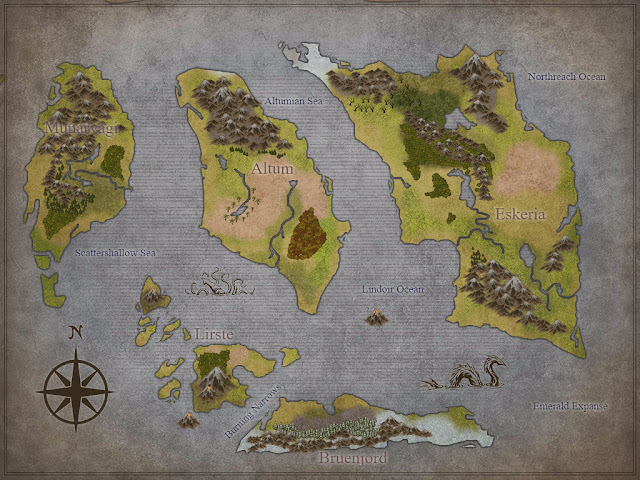 Over the last few weeks, I've been working on creating a world for my players to inhabit. It's a slow process that involves a lot of reading, writing, drawing, rereading, erasing, rewriting and redrawing. In the end we hope to have created an environment that the players can make themselves at home in and really become a part of. The first session, the reveal of that world is one of the most terrifying moments as a DM. Will the players like it or will they spend the next few hours shitting on the world you've spent weeks creating? Worldbuilding is a critical part of any campaign, even one drawn from a pre-written adventure path. A proper game should feel as though things and NPC's exist outside of the player's experience, and most adventure paths give copious notes on the lives of important NPC's as well as histories of locations and factions. When I set about creating a world for a home brewed game, I start with a map. I've been using Inkarnate lately and have been able to come up with some really gorgeous looking maps in a relatively short period of time. With the overall world at least drawn, I can start looking at some of the geography of the place and deciding how civilization has spread and thrived in this world. An early version of the worldmap for my next campaign. Built using Inkarnate. For the history of specific regions or peoples, I often draw from classical mythology. Norse, Greek, Japanese, Polynesian and Mongol mythologies are some of my favorites to pull bits from. I use these bits to build a greater belief system and culture for the regions of the globe. This often requires that I tweak some of the more canonical bits about the various races in D&D, but it helps to add depth to the world and make it stand out from the standard settings found in the adventure paths. With 5th edition I'm trying out some regional background traits that my players will take based on where they are from and what their role in that region was. I'm not quite sure how it's going to work out just yet, but I hope it gives the players something to connect them to the world. Once I have the regions and civilizations in place I start to think about how these people interact with one another and survive in their environment. By looking at the geography of the various areas in relation to the location of towns and cities (I always try to mark at least 10 large towns and cities) I can start thinking about what life in that area would be like. For example, for the city of Grigsberg, an inland city deep in the mountains, I had to ask myself the following: How do people in mountainous areas live? What challenges would this group of people have here? Is the terrain better suited to a certain race? All this just gives me a base outline of the world. From there I can start tweaking things. I can think about specific industries and how important they are for survival in this world. If I created any unique monsters for the world, I have to decide how they fit into the environment and how do the people of this world regard them? When you really get into it, the process can be a great deal of fun. The essential idea is to start big and then dial in your focus more and more, filling out each area before going in any closer. I have found this approach to yield pretty good results, given enough time to prepare.